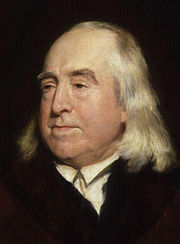 We often discuss the work of Jeremy Bentham in torts as one of the leading figures in the utilitarian movement — the scholar who coined the phrase “the greatest good for the greatest number.” Many students, however, remember him primarily for his preservation in a wooden cabinet called his auto-icon from which he would be removed annually to preside over meetings of his society of friends and even given a glass of sherry. The University College of London removed Jeremy last week to give him, or at least his auto-icon, an extreme makeover. The good guy looked pretty good for a 160 year old mummy. Bentham has specified in his will that he was to be preserved with his reading glasses embedded in his head to be a constant companion to this students and followers. His head however was disfigured in the course of preservation so it was cut off and a wax head put in its place. The real head was then laid at his feet between his legs. The University College London acquired the body in 1850 and kept Bentham on display at the end of the South Cloisters in the main building of the College. On the 100th and 150th anniversaries of the college, the Auto-icon was brought to the meeting of the College Council to preside over business for the institution. He is by tradition listed as “present but not voting.” However, when the council ties on any motion, the auto-icon always breaks the tie by voting in favour of the motion. It stayed on display at the college until 1975 until it was kidnapped by a group of students demanding a donation to charity of £100 for charity. The university forked over just £10, but the head was returned (no doubt as a demonstration of the greatest good for the greatest number). The head however is no longer on display but Old Jeremy’s cabinet is opened every day to watch over passing students and faculty. He is now back in his cabinet watching over the students and faculty with his slightly amused expression. the person you sell it web site to thinking, well, you know? Arabia where women are prohibited from driving at all. Actually it’s “University College, London”, ie a college of the federal University of London. Pedantic I know, but you are a lawyer. At the time of Bentham’s death, medical research using human corpses was illegal. Bentham could not, therefore, leave his corpse to advance the cause of medical science. 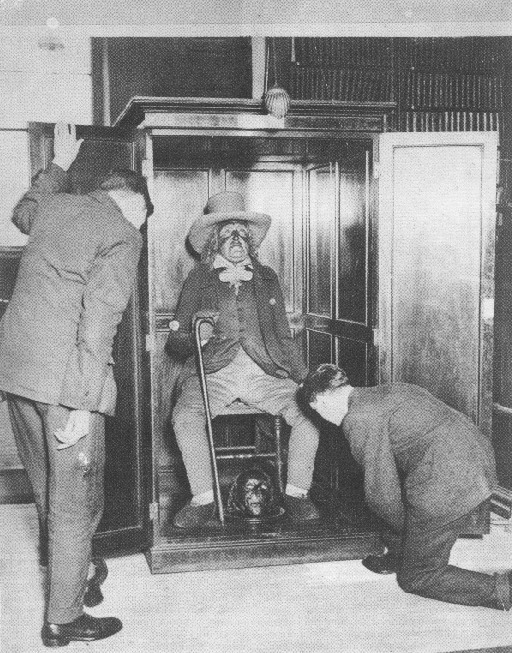 Nothing in the law prevented him from having his corpse stuffed and put in a box for public display. It is not unreasonable to take Bentham’s act as one of protest against the current legal status quo. Or is he a reminder to passersby that all our efforts are for naught, we all end up like him, although not on display as he is. Yes, so long as that philosophy understands the difference between dead and alive, which obviously some philosophies do not appropriately fathom. It gives new meaning to “death warmed over” doesn’t it? First I thought English universtity was explanation enough. Now I think there might be wider roots. In Sweden, we would call it “studentikos” or student humor. This chaps enshrinement (to what?) tells us that it is a humor which survives long after earning ones degree. Is he there only because he could not afford a pyramid or a proper grave? He is the embodiment of the plutocratic thinking that “governs” current “sophisticated” civilization. Totally should’ve kept the severed head. I agree with Frankly that it is creepy to have this mummy sitting around in the University College. Oh those English. You’ve got to love them!